The USL Championship Team of the Week has been announced for Week 3 and Locomotive fans will notice a familiar name in the starting XI. 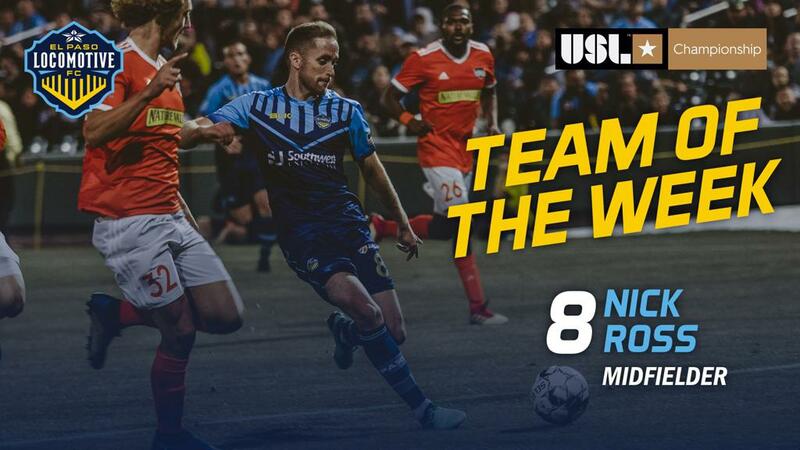 Midfielder Nick Ross is the first El Paso Locomotive player in the club’s history to grab a spot on the USL Team of the Week. After an impressive performance last Saturday night, Ross deserves the honor. He opened up scoring Saturday night in the 45th minute, sending a left-footed laser under a RGV defender’s legs and into the bottom right corner of the goal. Ross wasn’t done adding his name to the final stat sheet. In the 78th minute, Ross took the ball into the box and drew the attention of two defenders and the keeper, leaving teammate Derek Gebhard wide open. As the RGV defense closed in on Ross he was able to swing it to his right, finding the foot of Gebhard, and Gebhard finding the goal. El Paso Locomotive returns to action this Saturday against Orange County SC at home. Both clubs hold identical records (0-2-1) and goal differentials (-2). This match will shake up the standings and with a win could elevate El Paso into the top ten in the western conference. Season Ticket Memberships, Group Tickets, and Individual Match Tickets can be purchased at https://www.eplocomotivefc.com/ticket or by calling 915-235-GOAL!